When I first started blogging I had a full-time day job and I would work on my blog in the evenings and on weekends. I quickly found that most of my ideas for new blog posts happened when I was at work and not able to do anything with my blog, so I started a list and every time I had an idea for a post I would write it down. Before long I had a few hundred blog post ideas, and I could go over that list any time I needed to write a new post. With that list in my possession I was never out of ideas and I never had to spend a lot of time deciding what I should cover at my blog. I still keep lists of post ideas for my different blogs, and it has always proven to be a very valuable approach for me. 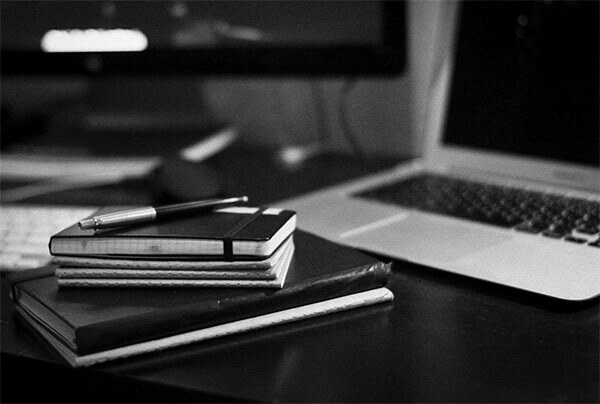 I highly recommend that if you do not currently have a journal or a list of post ideas that you start one right away. It could be in a small notebook that you usually carry with you, in an app on your smartphone, or a Google doc that you can access from any computer. Throughout the other steps and approaches that we’ll cover in this article you will be flooded with ideas for blog posts and having a place to list them is essential if you want to be able to remember them later. One of the things that I have always found to provide a creative kick start is to change my environment. I spend almost all of my working time at my desk in front of the computer, and sometimes simply sitting outside on the patio or taking a notebook into another room with a comfortable chair and no computer will help me to get out of a creative rut. Getting away from my normal environment seems to help me with thinking outside of the box and getting out of my normal constraints. If you want to take it a step further you can go to a park, a library, cafe, or even go to a secluded cabin for a few days. It’s amazing how much a change in your environment can help to impact the way that you think and improve your creativity. When you get away from your normal distractions you’ll find that you open up your mind and you may come up with some of your best ideas. Start by writing down your areas of expertise, and branch out from major topics to smaller sub-topics. Obviously, the topics that you know best are often the easiest to write about, and these topics also provide you with the opportunity to really help others who may not have your expertise. For example, if you are a travel blogger you may have expertise in areas like road trips, budget travel, solo travel, and European countries. Under each of those main topics you could drill down and list sub-topics that also encompass your areas of expertise, and these would be excellent options for blog posts. 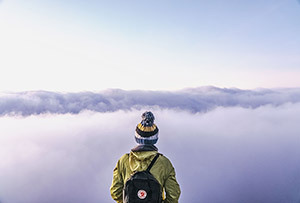 For example, under the topic of budget travel you may be an expert at finding low prices on rooms, alternatives to hotel rooms (hostels, home swaps, couch surfing, etc. ), negotiating unadvertised prices, using credit card points and frequent flyer miles, and so on. A lot of times when we’re thinking about possible blog topics we overlook opportunities to demonstrate our expertise and to really help others by sharing from our own experience. This is an approach I have been using with a few of my blogs recently and it has been working really well for me. I’ve been making an effort to improve my autoresponder emails that are sent out after someone subscribes to my list. I want to use the autoresponder to provide useful information that will help me to build credibility and develop a relationship with subscribers. I want to use the autoresponder series to link to posts/pages on my sites that provide evergreen content that will continue to be relevant and useful for months and years to come (even if it needs a small amount of updating every now and then). So the approach here is to think about what types of content you would want to link to from your autoresponder emails that will serve as a series that will be promoted over and over again as new people subscribe to your email list. Let’s stick with the previous example of a blog in the travel industry. You can write blog posts on the following topics and then link to them in your autoresponder sequence: ways to save money for traveling, how to find the best travel deals, tips for saving money on travel, how to get started with a travel rewards credit card, tips for better travel photos, and tips for safe travel. All of these topics could continue to be useful for your readers a few years from now and should continue to help you grow your blog well into the future. When I sat down and thought about this type of evergreen content for my own blogs I realized that I had been overlooking a lot of basic, fundamental topics. If you sell products at your site/blog you can also think about the types of content that will help to educate visitors on your products, how to use the products, and how the products can help them. As you are typing a phrase for a Google search you will be presented with some suggestions using an autocomplete feature. This can be helpful when you are searching, but it can also be used for finding new blog topics. Google suggests phrases that people are actually searching for, so it can be a good way to find keywords and phrases that may send traffic to you. For example, in the screenshot below when I typed “things to do in Rome” it suggested the search for “things to do in Rome at night”. This topic could make for an interesting and informative blog post, and hopefully it would rank well for that phrase when other people search for it. As you can see, Ubersuggest is a great way to take a basic idea and turn it into a lot of different possibilities for blog posts. And best of all, they come from real searches. Using Google search suggestions and Ubersuggest can help you to find some great ideas for blog posts, but using another tool for keyword research can help you to uncover even more possibilities. Each keyword tool is a little bit different and you’ll get different suggestions and data accordingly. My favorite tool for keyword research is Long Tail Pro. I like Long Tail Pro because it is easy to use, effective, and affordable. It’s great for not only finding keywords to target, but also for analyzing the competition so you know if it is a word or phrase that you can easily rank for. Unlike most SEO and keyword tools, you can use Long Tail Pro without a monthly recurring fee. 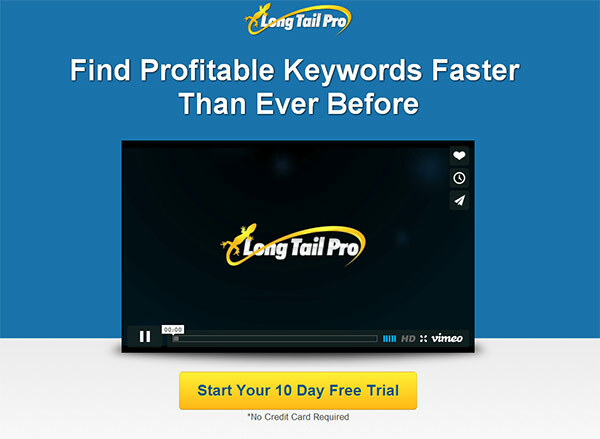 Long Tail Pro can be purchased for a one-time fee of $97. There are some additional features that require the monthly membership of $17 per month, but the base plan will give you more than enough for basic keyword research. It also comes with a 10-day free trial, and you don’t even need to enter your credit card info to get the free trial. 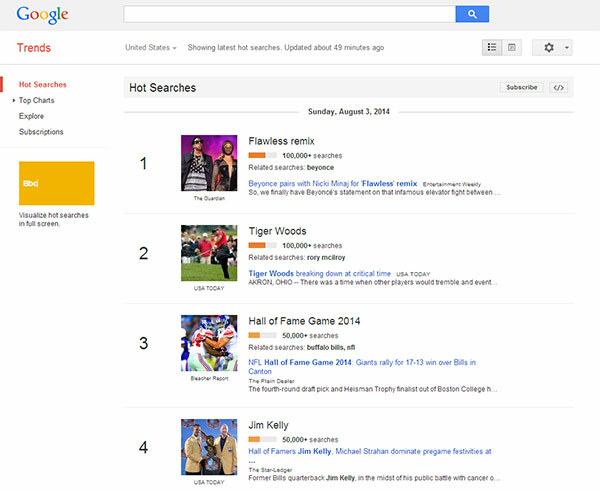 Google Trends shows hot topics that are popular with searchers. You can also browse topics by category. The topics that show up on Google trends are of interest to a lot of people, and if you are able to quickly get a blog post online and ranking well for a trending search it can bring a flood of new traffic. One often overlooked approach to finding blog post topics is to start with a template for blog post titles and fill in different topics that fit well with the main topics of your blog. Starting with a title template can help to come up with a large list of post topics very quickly. Just using a 5 – 10 post title templates and a few minutes for each one should result in a huge number of possible blog posts. Browsing forum topics and threads is a great way to see what topics are popular among people in your target audience, and to see what information people are looking to find. Participating at forums can easily become a time-consuming process, but if you just want to get some ideas for blog posts you don’t need to dedicate a lot of time to it. In most cases you can just browse the list of recent threads and read the subject lines to see what people are discussing. If you want to take it further you can click on some of the threads to see how much discussion is taking place, but just by browsing the subjects you may be able to get some post ideas. 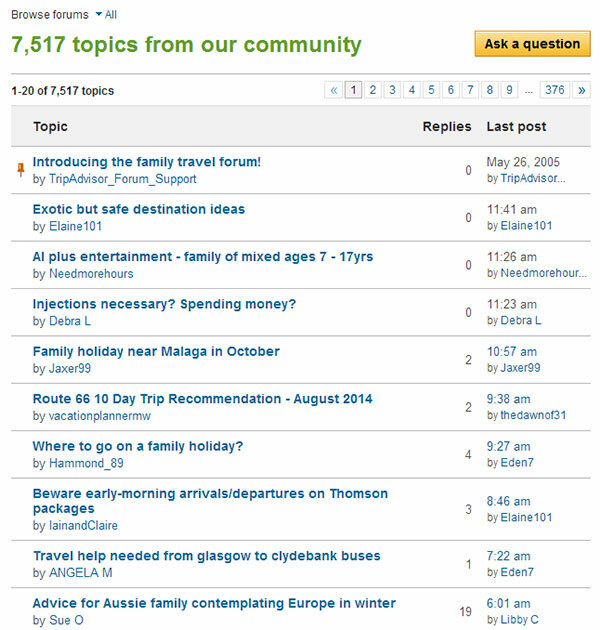 The screenshot below shows only the first few forum threads in the Family Travel forum at TripAdvisor. The second topic of exotic but safe destinations could make for an interesting blog post. Social media sites can also help you to identify hot topics and popular types of content. Sites like Hashtags.org will show you trending topics. Some sites, like Pinterest, will also show you hot items in a particular topic. 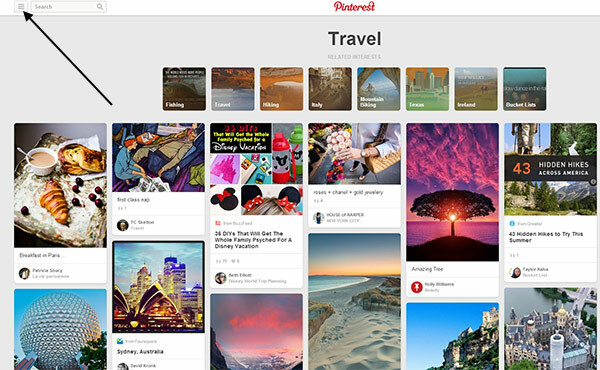 When you go to the Pinterest homepage if you are logged in you will see pins from the users that you follow. If you click on the navigation icon in the upper left corner it will open a list of topics and you can click on the one that is most relevant to your blog to see what items are being pinned. You don’t have to limit yourself to only looking at the topic that is most relevant to your blog. You can browse any topic if you want to see the types of posts and titles that are catching people’s attention. You may be able to apply some of the same principles to topics that would be relevant to your blog. Open Google Analytics, or whatever analytics program you use, and take a look at the pages on your site that get the most views. If you see topics that tend to do well, focus on brainstorming some related posts that also may be of interest to a lot of people. Take a look at some of the more popular pages/posts on your site and see if there are opportunities for you to drill down and narrow the focus onto a particular aspect of that post. For example, one of my most popular posts here at ProfitBlitz is 101 Massively Useful Link Building Ideas. That post includes about a one-paragraph description of each link building approach that is mentioned. I could easily take the ideas mentioned in that list and go back and cover them in more detail. I could write a post that provided more detailed information about how to implement one of those 101 ideas, or I could write a post that covered specifics of a small number, like 5 – 10, of the ideas. You don’t need a post with 101 of anything in order to use this approach. Just start with your most successful blog posts, scan through them and look for opportunities to focus in on one particular aspect or point of the post. What’s Your Approach to Brainstorming Blog Post Ideas? Feel free to share your own tips and suggestions for coming up with blog post ideas.